If Apple were publishing this blog it would be an iVice column. If 1998 were publishing this blog it would be an E-vice column. 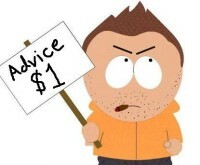 And if an advertising executive were publishing this blog, it would be an Advice column. As it is, this is just a blog written by a guy who has learned a thing or two about marketing and communication in an internet and community driven world. I will share some tips and opinions on how to best promote your company, publicize your products, and relate to a new age of consumers. For some, you will get a lot out of it. Others may get less. My hope is that we can start a positive conversation that leads to new ideas and solutions for small and medium sized businesses looking to grow their brands.